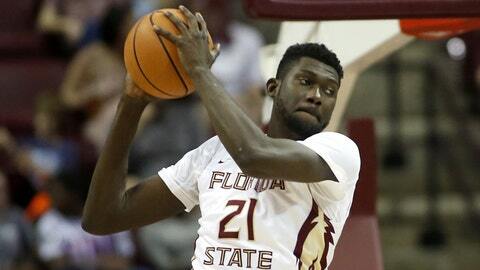 Christ Koumadje and FSU visit NC State on Sunday evening in their penultimate game before the ACC tournament begins. RALEIGH, N.C. — North Carolina State has a chance to bolster its late-season credentials as it continues to move through the Atlantic Coast Conference as one of the surprise teams. No. 25 Florida State is looking to achieve more as well. The teams meet Sunday night at PNC Arena. Florida State (19-8, 8-7 ACC) hasn’t played since last Sunday, while N.C. State won its third straight game Tuesday night when it defeated visiting Boston College. This is another chance for N.C. State (19-9, 9-6) to enhance its NCAA Tournament stock. “Every win builds confidence, and I know you’re talking about ‘bubbles’ and all of that, but I don’t even talk about that,” Keatts said. “I don’t even know about all of the brackets that say where you’re at. I just try to win the next game. I’m excited. I don’t take it for granted. Both teams have a chance to finish in the upper half of the conference standings if they can break free from the cluster in the middle. The Seminoles have won their past two games, returning to the national rankings for the first time in more than a month. In a pair of home games, they needed overtime to defeat Clemson and then topped last-place Pittsburgh. Without a mid-week game, Hamilton said his team had a chance to re-energize physically. Florida State’s P.J. Savoy has been back for three games after missing seven games with an injury. He shot 5-for-7 on 3-pointers against Pittsburgh. The Wolfpack have their own perimeter firepower. N.C. State guards Braxton Beverly and Sam Hunt combined to shoot 9-for-10 on 3-pointers Tuesday night. “We’ll keep doing what we’re doing now and keep getting wins,” Beverly said. This is the only scheduled meeting between the teams this season.